John MacBride (1868 - 1916) - Mayo, West of Ireland, from a shopkeeper/trader background. 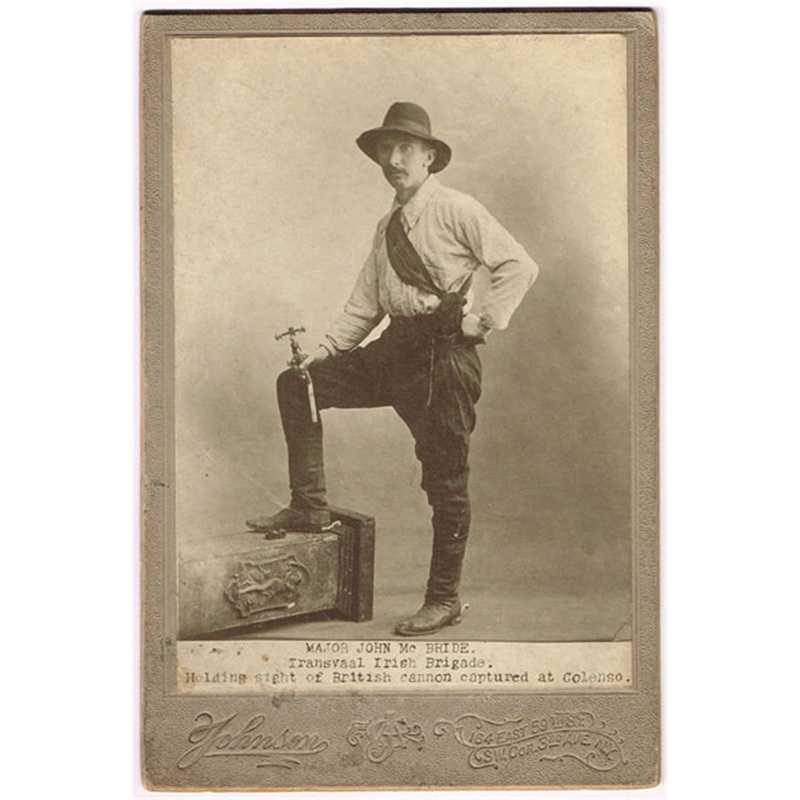 John MacBride was a member of the IRB from a young age and knew Arthur Griffith. In 1896 he emigrated to South Africa and was promoted to Major in the Boer war. Maud Gonne was one among many Irish Nationalist supporters of the Boer war. John MacBride, on his return to Ireland went to Paris, to avoid prosecution by the British. There he met Maud Gonne, who had just separated from Lucien Millevoye. 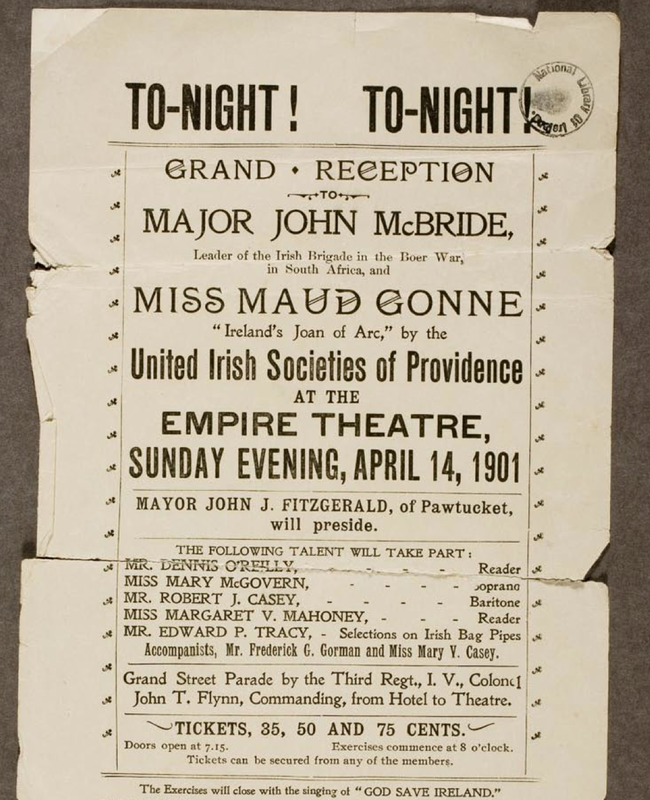 She lectured with MacBride on two tours of America, to raise awareness and funds for the Irish cause. Maud became a Catholic in order to marry John MacBride. All their friends warned against it. He was a drunkard and disagreed with her feminist politics. It is difficult to understand her reasons, and she would live to regret it, except for one thing, her son, Sean MacBride, who was born a year later 1904. The couple separated in 1905. There was disagreement over custody of Sean and so Maud brought divorce proceedings against John in France. This allowed her to have a more private divorce and to keep her accusations of John MacBride's abuse of Iseult out of the Irish papers. Maud was granted the divorce under French law and given custody of her son until the age of 12. John MacBride was given visiting rights but returned to Ireland after a Boer war amnesty and never saw his son again. Maud was as a result, exiled in France. She did return to Dublin at times, without her son, but sometimes with Iseult. She was involved in humanitarian issues and in the forming of women's nationalist groups, but her divorce from MacBride, a national hero in Ireland, diminished her popularity in Dublin. When she visited the Abbey theatre in 1906 with Yeats she was booed by the audience as she and Yeats took their seats. John Mac Bride was not one of the signatories of the Proclamation. He was unaware of plans for a rising, He was in Dublin city on the day to meet his brother and coming across it, offered his services. He was given joint command of the Jacob's factory. He was executed along with others involved, in May 1916. Sean was twelve and Maud was finally able to bring him to Ireland. This became her main focus in 1916/1917, much to the distress of both Yeats, Iseult and the British authorities.